Traffic lights are put in place to dynamically change priority between traffic participants. Commonly, the duration of green intervals and the grouping, and ordering in which traffic flows are served are pre-fixed. 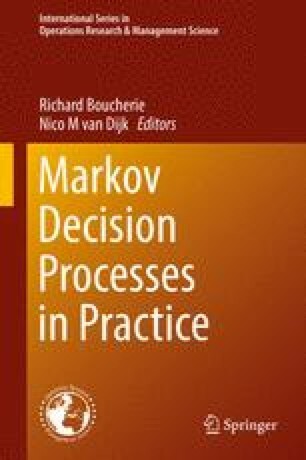 In this chapter, the problem of minimizing vehicle delay at isolated intersections is formulated as a Markov Decision Process (MDP). Solving the MDP is hampered by a large multi-dimensional state space that contains information on the traffic lights and on the queue lengths. For a single intersection, an approximate solution is provided that is based on policy iteration (PI) and decomposition of the state space. The approach starts with a Markov chain analysis of a pre-timed control policy, called Fixed Cycle (FC). The computation of relative states values for FC can be done fast, since, under FC, the multi-dimensional state space can be decomposed into sub-spaces per traffic flow. The policy obtained by executing a single iteration of Policy Iteration (PI) using relative values is called RV1. RV1 is compared for two intersections by simulation with FC, a few dynamic (vehicle actuated) policies, and an optimal MDP policy (if tractable). RV1, approximately solves the MDP, and compared to FC, it shows less delay of vehicles, shorter queues, and is robust to changes in traffic volumes. The approach shows very short computation times, which allows the application to networks of intersections, and the inclusion of estimated arrival times of vehicles approaching the intersection. This section summarizes the notation used for defining the MDP: i.e. for respectively, the state, action, transition probability, and value function. = Single-period transition probability related to lane f.